In addition to strengthening your bones and muscles, this weekend’s challenge will help you to overcome the fear of falling. The Balancing Leg Lift targets an often-overlooked area of the lower back and buttocks, improving balance and strengthening the legs and glutes. This, in turn, gives you confidence in your ability to balance and pays big dividends in protection against falling. I’d like to start with a brief discussion on fear, falling, and balance, and how the data support regular exercise as the indisputable key to overcoming these issues. Fear is one of your biggest enemies along your bone health journey. Yet ironically, it’s often the first emotion you experience when you receive an osteoporosis or osteopenia diagnosis. Your doctor likely didn’t help you to reduce the fear; he or she may have painted a bleak picture of your future in a wheelchair…and most likely touted prescription drugs as the only way to escape this future. And then the fear changes in nature. Perhaps your initial fear faded as you researched, discovered that osteoporosis is not a disease, and chose to follow a drug-free, clinical nutrition-based lifestyle as described in the Osteoporosis Reversal Program. But the fear creeps back as your friends, family members, doctor, and so many others begin to question your choices, and you lose confidence and wonder if you’re doing the right thing. There are various articles on the Save Our Bones blog that address the topic of fear, because it’s very important to get this under control while moving forward with reversing bone loss. What you’ll discover as you embark on your journey to strong, healthy bones is that the number one antidote to fear is knowledge. That’s one of the reasons why I continue to research and bring you the truth about all aspects of osteoporosis, including the emotional impact. …and as many studies show, that “something” is exercise. So starting right now, you can begin taking action on the fear of falling with this weekend’s challenge. It’s a good idea to perform this exercise near a wall or chair so you can catch yourself if you lose your balance. If you’re not sure how good your balance is, take this 30-second test to find out. Stand comfortably with your knees “soft” and your feet shoulder-width apart. Take a relatively big step back with one foot. Place your foot behind you, keeping your heel off the ground. Hold your hands out in front of you, palms up, as if holding a large ball. Now lift your back foot six to 10 inches off the ground, using your glute (buttocks muscle) to lift it. If you can only lift a few inches, that’s fine. Lower your foot back down and repeat the lift eight to 10 times for one set. Switch legs and complete a set with the other leg. Aim for two to four sets on each side. Keep your torso vertical throughout the exercise; resist the temptation to lean forward to lift your leg. This helps isolate the glute muscle. Hold your arms still throughout the exercise. Lift your foot slowly – don’t kick your foot up to gain height. If you can only lift it a few inches slowly, that’s fine. Keep your knee “soft” on the stationary foot; don’t lock your knee. Touch your toes to the floor as you lift your leg; the heel of the working leg should not come down to the floor. 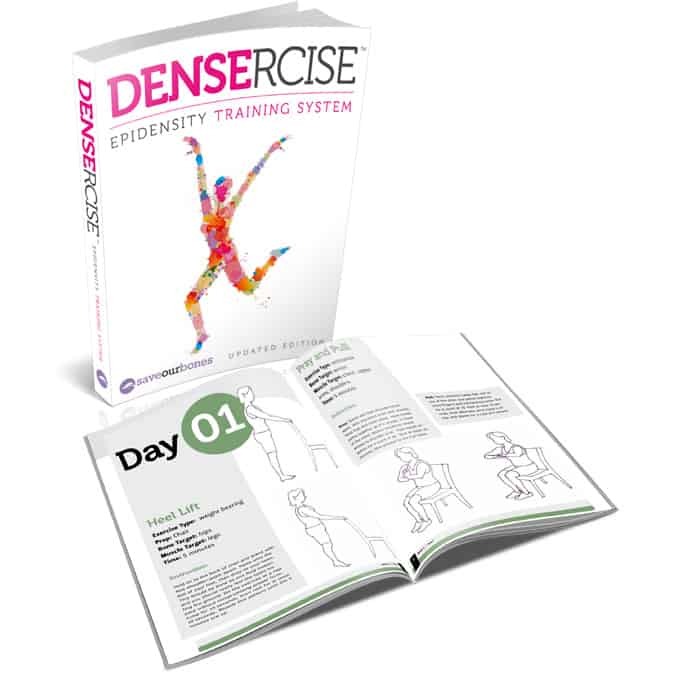 The Densercise™ Epidensity Training System is the perfect weapon in your fight against osteoporosis and the fear that can accompany it. The complete Densercise™ system has more than 50 moves, all of which are designed to increase bone density, strengthen muscles, and improve your balance to effectively prevent fractures. It’s time to trade in your fear for confidence! This is a difficult one for me, so I definitely need it. I’ll have to work on it. I have the whole Saveourbones package from the “book” , diet info. and dencercise. I intend becoming more disciplined with this but unfortunately I have two low lumbar herniated discs and worry about which exercises are safe. Can anyone at “Saveourbones” give advice on this or even perhaps modify your challenges for this, as I do want to try the Weekend Challenges. If you have access to Youtube, then look up “How to fix a bulging Disc (No Surgery)”. You’ll find a great safe exercise there that would sort you out quickly. Just received an email from my family in Newberry, South Carolina and they were fortunate enough to have “dodged a bullet” Hurricane Irma veered to the left and missed them completely. Apart from high winds and heavy rain they were unaffected, did not lose power at all and just a large pine tree came down…….dead from a previous storm. My heart goes out to those greatly affected but also grateful that you were not one of them……..happy that I and others could at least offer moral support and grateful for Vivian’s site as a way of communicating. Other savers will be relieved as well I am sure………we have become a community of carers and that is the way it should be. Vivian, I hope you & your family & friends all managed to get out of the way of that Hurricane. Sent from South Africa. We’re all safe, Joy! Thank you for your concern. How do I join with you to get these emails? I always enjoy receiving these exercises, as they provide me with a variety of ways to target various muscle groups. My father-in-law, who lived to 96, used to say, “Use it or lose it.” And as I age I find I can only agree. Our bodies need movement and the more variety, the more agility and general ability will remain. I echo June’s words above too. Your father had it right, Terri, and so do you. Our bodies absolutely need movement, and variety is a key element in building bones through exercise! What a great lesson about fear Nicole! Thank you for your kind words. Thankfully, we are safe here. My thoughts are with you and everyone else who is affected by this storm. Stay safe and strong! You are most welcome Nicole, I hope everything will be OK for you and your family, please let us know the outcome of Hurricane Irma and how it affected you when you can. Just stay safe. I am sure there are other Savers who care and would also like to know. This comment has nothing to do with the above article it is simply a message from me to you and all the people in Florida and any of the other States which will be affected by Hurricane Irma. I have family in South Carolina and hold grave fears for the safety of my loved ones. However, if ever there was a time for positive thinking it is now, take care of each other, neighbours, friends and even complete strangers, material things can be replaced but lives cannot. Remember your animals as well. My thoughts and prayers will be with you all in this uncertain time and it is important that you stay strong until it has all passed, life will go on regardless. What a thoughtful message June, thank you!